Hopefully, this figure will help you understand how everything relates. The parts of the table specified. Underside of the top showing one of the racks. The chalk marks denote the travel extents. Begin by locating the stop plates (small, hardened metal plates which impact the stop rods during opening) in the table top. 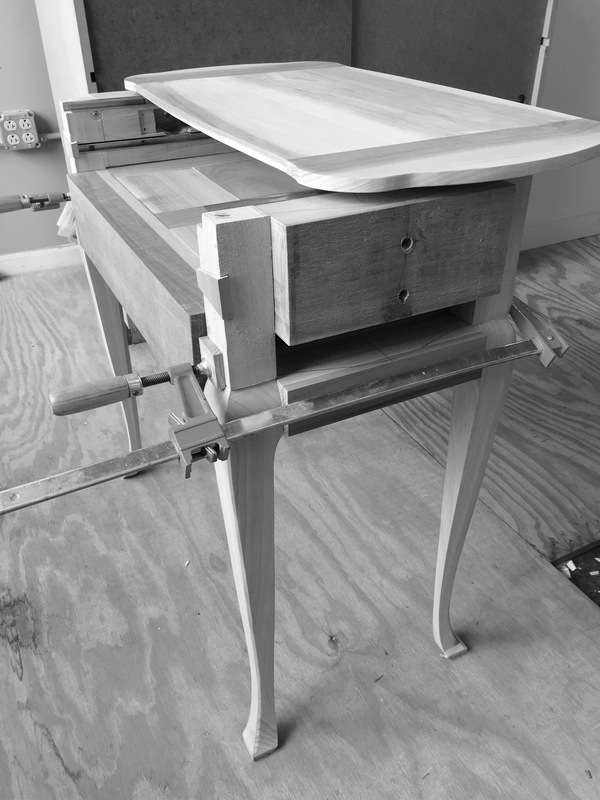 Install the stop rods in the aprons, using them to define the grooves in which they will eventually be housed. The extents of the table when open, and closed can be determined by positioning the top (and main box) in each state. Since the two pieces are connected through the mainspring barrel drive gear, this also governs the plate locations limiting the main box in grooves nestled out-of-sight within the aprons. Bolts visible within the side compartments of the main box protrude through its walls, and travel in these channels. With the open, and closed positions of the main box and top defined, the main box latch plate can be marked and mortised. As with everything in this project, sequencing is critical! 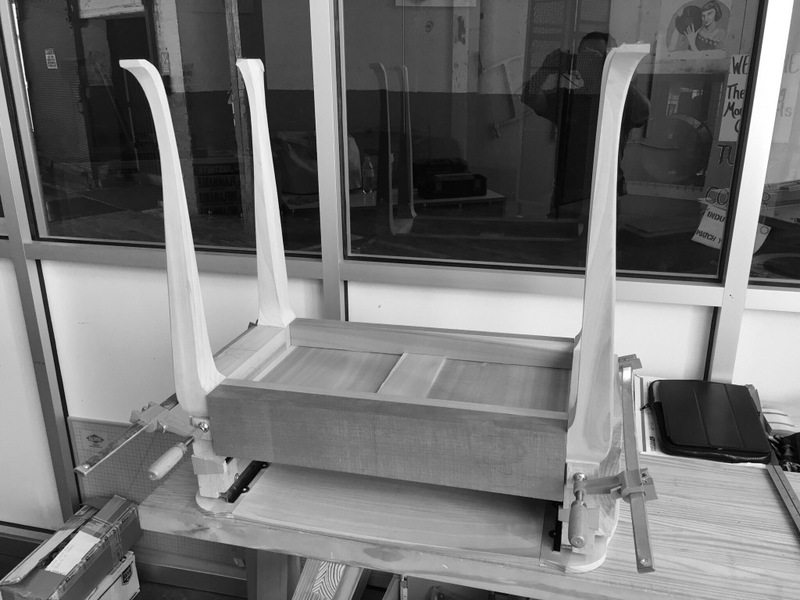 The prototype table (stripped to almost its essentials!) showing the areas of consideration. Consider that when the original table was built around 1750, micrometers weren’t a standard tool in an ébéniste’s kit (they still aren’t). So, while the various parts and pieces fit tightly together, it should not require fractions of a millimeter alignment to get things working. Check each guide by holding a straight edge to its back – it’s ever so slightly convex, bulging into the travel path. Could this be the hang up? Just a slice of light between the rack and rear apron. Following about 40 minutes of discussion with Jim, my studio “neighbor”, I realize the upper racks have been installed just slightly askew. Rather than the distance between them being identical at each end of the rack, they are farther apart on one end than the other. So, if I install the top from the rear of the carcass into the guides, it fits albeit tightly. However, when I attempt to slide the top into the carcass from the front, the racks are too far apart to fit into the guides. To compensate, remove one rack, adjust its mortise, then reinstall it. This can be prevented in the future version by using a spacer stick or panel during assembly. But that’s not the only problem in this case. Underside of top illustrating out-of-parallel racks (lines exaggerated for clarity). Turns out, when the top racks were installed they were set against the guides, marked, and fastened. This left no space between the guide and the vertical part of the rack where it passes the guide on its way to the top. What I’m feeling is that friction is increasing as the top is slid into the guides – the further it goes, the more these rub against one another. Try spacing the guides further apart, about 1 mm – friction decreases! By opening this gap 1 mm, the top slides freely! Eventually, addressing all of these issues I’m able to get the top sliding smoothly through the guides. When the mainspring barrels are added, and the top is pulled into its closed position, it gently swooshes into its open position when released. Success (finally)!